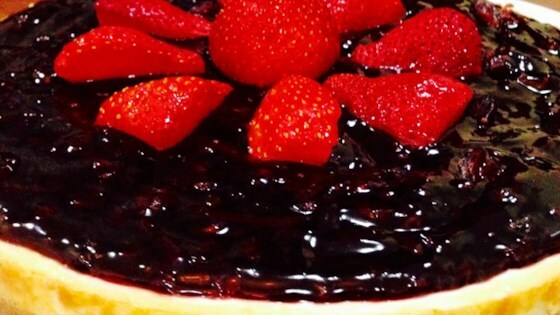 "Delicious cheesecake with fresh blueberry topping." In a medium bowl, combine graham cracker crumbs, melted butter and 1/2 cup sugar. Press into the bottom of an 8x12 inch baking pan. In a large bowl, combine cream cheese, eggs and 1/2 cup sugar. Beat until smooth. Spread cream cheese mixture over crust. Bake at 350 degrees F (175 degrees C) for about 15 minutes. For the blueberry filling: In a large sauce pan, combine blueberries, water, corn starch and 1 cup sugar. Cook and stir until thick. Spread blueberry filling over baked cream cheese mixture. Let cool. Top with whipped topping. Refrigerate overnight before cutting into squares and serving. See how to make a sweet and tart, two-berry pie from scratch. I only used the recipe for the cheesecake and didn't do the topping, but instead poured a can of cherry pie filling over the top. Was very delicious and thanks for a perfect recipe! !